EspañolThe world is ending. We’re running out of natural resources, the population is growing, and someday we won’t be able to feed all those people. Genetically modified frankenfoods are causing nightmares of all sorts, and the climate change we’re creating will lead to a global meltdown. Or at least that’s what many want you to believe. But not Ronald Bailey. 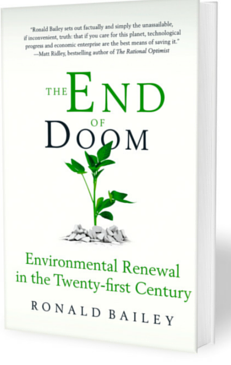 The Reason magazine science correspondent offers a full-throated retort to these “doomsters” in his excellent new book The End of Doom, seeking to dispel a wide range of apocalyptic notions. Much of the book follows up on arguments made by economist Julian Simon. Those who have read the the man’s work will appreciate this worthwhile update to many of the points Simon made famous decades ago. The book kicks off with a rebuttal to the doom-saying Neo-Malthusians, those who feel the planet simply cannot feed the world’s current or future population. Bailey makes clear that humans are not like other creatures. When faced with food shortage, we have the ability to innovate to increase yields and feed a population well beyond some calculated “carrying capacity” for the natural environment. Indeed, increasing agricultural activity has recently allowed many acres of farmland to be returned to nature. Bailey notes that some low-hanging fruit remain to advance agricultural intensity even further, allowing more people to be fed on less land. Moreover, population growth has slowed, and it is rather clear that we will never reach a point when there won’t be enough food to feed the planet’s population. But what about natural resources? Oil, gas, minerals, and such things must run out someday. Not so, Bailey explains. The author liberally cites many mainstream scholars to show that “peak oil” is a myth that has been rather thoroughly debunked. Further, when prices rise, the incentive to innovate becomes greater, leading to new and more efficient use of what resources are available. Just like we are not running out food, we are clearly not running out of natural resources either. The book moves on to a few chapters looking at other scares put forward by apocalyptic environmentalists. Political scares over carcinogens in foods and other products have largely proved to be vastly overstated. Genetically modified foods have never made a single person sick. While global warming is real and observable, there is reason to believe humans will be able to innovate to solve the problem, just like with food constraints. Despite dire warnings, time and time again, doomsayers have been proven wrong almost every time. Bailey’s book is an excellent primer for anyone interested in environmental policy. He seeks to debunk many intuitive, popular ideas, ranging from Neo-Malthusian food or resource constraints to fears of GMO-induced agricultural apocalypse. While the piece is generally excellent, it is certainly written for a laymen audience. This makes the book eminently readable for the genre, at the cost of adding little new scholarship to the body of knowledge. Overall, the piece is certainly worthwhile, and deserves the accolades that it has already received. Nick Zaiac is a public-policy researcher in Washington, DC. He also serves as a policy analyst at the Maryland Public Policy Institute. His column, The DC Leviathan focuses on the often-ignored bureaucratic agencies, from the Department of the Interior to the General Services Administration. He has been published in the Baltimore Sun, City AM, CapX, and other outlets. Follow @NickZaiac.